You can’t get through the holiday season without enjoying Bing Crosby’s recording of White Christmas a few times. Various artists have put their stamp on the classic over the years, but none will ever touch Bing’s version. You may know that there’s a major connection between Bing Crosby and the Palm Springs area – Rancho Mirage specifically – but did you know that there’s also a connection between the desert here and a white Christmas? Bing had a wonderful estate in Rancho Mirage, just across the street from the Thunderbird Country Club. Bing’s love of golf is almost as famous as his silky smooth singing voice and he actually helped establish the Thunderbird Country Club. His estate there is 6,700 square feet, five bedrooms and six baths. Visitors to our area can rent it today if they want to get a feel for his lifestyle. I also need to mention that the neighborhood where it’s located is Thunderbird Heights, which has been home to many celebrities over the years. In fact, Rancho Mirage itself is often called the “Playground of the Presidents” because of its rich history with First Families over the years. But what about White Christmas? you ask. If you’re familiar with the geography of La Quinta and the Coachella Valley, you know that we back up to the San Jacinto Mountains. This year we got our first snowfall on the mountains in the week before Christmas. It’s not uncommon to get up on Christmas morning, look up to the mountains and see snow. And if you, visiting children or grandchildren feel like waging a snowball fight, you can always buy a ticket, hop on the Palm Springs Aerial Tramway and take the ride to the top of the mountains. Is there any other place in the world where you can have breakfast outdoors under a palm tree and in less than an hour be hiking under snowy pine trees? I don’t think so. And in the same way, where else can you have a snowball fight with your family and friends and an hour later be playing golf on beautiful green fairways? The combination of the climate and geography of Palm Springs, La Quinta, Indian Wells and the Coachella Valley is truly one of nature’s wonders. You can really see how the desert meets the mountains when you download our free Golf Resource Guide. It lays out the valley floor with the location of all our great golf courses and the communities that surround them. Also included are guidelines for the price of homes as well as country club memberships. If you want to walk the same fairways at the Thunderbird Country Club that Bing Crosby walked, you’ll find it on our map along with membership details. You’ll also see the great family of courses and communities at La Quinta Resort, including the Pete Dye designed La Quinta Resort Dunes Course, Mountain Course and Citrus Course. Our guide to Palm Springs area golf clubs is an excellent way to start your search for real estate in La Quinta, Palm Desert, Indian Wells and the neighboring communities. And when you’re ready to delve a little deeper into property and homes, give us a call. We would love to help you find the ideal place for you and your family in our beautiful area. The folks who write travel brochures toss around words like “magical” to describe places they would like you to visit. Often these vacation spots are very nice, but “magical” might be stretching it a little. However, I’m going to confidently step out on a limb here and tell you that the Agua Caliente Cahuilla Indian’s Palm Canyon truly lives up to being described as magical. It’s the world’s largest fan palm oasis and walking into it is like stepping into an exotic world all its own. It’s part of the Indian Canyons on the land of the Agua Caliente Cahuilla Indians and is tucked in behind Palm Springs. They maintain the area and charge a small fee for admission to the hiking trails. Also in the area are Murray Canyon and Andreas Canyon, which treats visitors to a perennial creek. The plant and animal life in these little self-contained ecosystems is abundant, including some rare and threatened species. When you look up to the canyon walls, you see stark walls of red rock, but on the floor of the canyons, there is rich, green plant life. The shade the palms provide along with a source of water, sustained the first inhabitants in this area. When you visit, you can develop a real appreciation for what life was like before the first European settlers arrived. You’ll also find reminders of when the ancestors of today’s Caliente Cahuilla Indians lived there, including rock art, house pits and foundations, irrigation ditches, dams, reservoirs, trails, and food processing areas. Imagine yourself to be an early explorer, parched by the dry desert floor, when you discover that hidden away in the rugged mountains is a series of cool, green and even wet oases. Could there have been a more welcome sight? Of course, life is quite a bit easier today for the residents in Palm Desert, La Quinta, Indian Wells and the general Palm Springs or Coachella Valley area. But it’s always a good idea to remember the roots of the area where you live. When you have these images filed away in your mind, you’ll probably recall them often when you’re out on one of our golf courses. You can see that many of our courses here are inspired by locations such as Palm Canyon. They make almost artistic use of the dramatic meeting of the rock and sand with the green of native plants. And while I gave travel brochure writers a bit of a hard time at the beginning of this article, I have to say that there is something magical about being out on a course like The Citrus Club, the Dunes Course at the La Quinta Resort, Rancho La Quinta and many others with a green fairway under your feet, a clear blue sky over head and mountains to your side that display an almost infinitely varied palette of reds and tans. There’s only one thing better: living alongside such natural and man-made beauty. It’s no mystery why people continue to settle in La Quinta and the Coachella Valley as a whole; this area has the natural beauty, the recreational opportunities and the climate that makes for an ideal home base. Take a moment to download our golf course resource guide. It’s really much more. It gives you an idea of relative home prices, country club fees and a listing of area restaurants. And after you’ll mulled the golf course guide over for a little while, call us or drop us an email so we can answer your questions and help you find your ideal home. Deserts are often referred to as places of extremes, and that’s one of the qualities that makes them such dramatic and dynamic places to live. Spend one evening watching the colors wash over the mountains that surround the Coachella Valley as the sun sets, and you’ll get a feeling for the magnificence. Artists from throughout the area are displaying works that illustrate our natural relationship to water in the La Quinta, Palm Springs and general Coachella Valley area. We tend to think of deserts as arid, rainless places, but that is a simplification that doesn’t really capture the truth. When you see the snow atop the Santa Rosa-San Jacinto mountains in the winter, you know that the area gets its share of moisture. And when a major storm blows through the area, the dry creek beds become powerful torrents of water. However, most of the water here in the Coachella Valley, while ever-present, goes virtually unseen. Whether you’re walking a golf course, driving a local road or relaxing in your back yard, there’s an ancient and plentiful aquifer beneath you that supplies homes and businesses with all the water they need. Its natural abundance along with smart management practices is one of the blessings we enjoy in La Quinta and the surrounding communities. Perhaps that most beautiful reminder of the area’s winter rains is the spring wildflower bloom. The timing of the rains and how much rain we get over the winter each year determines when you can expect to start seeing the bloom and how strong it will be. I see the desert flowers as a living reminder of the nourishing rains we receive each year. Of course, compared to a place like Seattle, Washington, our rainfall amounts are rather paltry and this causes almost everyone to get creative and resourceful in how they use water. Over the years, our golf courses have taken the challenge of operating within our climate to heart. They have done pathbreaking work to make themselves good stewards of the resource while providing golfers with exceptionally beautiful and challenging courses at the same time. You may know that Audubon International has a program that recognizes excellence in golf course design and management. The program certifies courses that do a great job with the environment, and here in the Coachella Valley, water conservation is a very important factor. Here are courses in our area that are Certified Audubon Cooperative Sanctuary Program Golf Courses: Greg Norman Course at PGA West, La Quinta; La Quinta Resort and Club, La Quinta Citrus Course, Mountain & Dunes Courses; Marriott’s Shadow Ridge Resort, Palm Desert; PGA West, La Quinta, Arnold Palmer Course, Nicklaus Private & Weiskopf Courses, and Stadium & Nicklaus Tournament Courses; The Classic Club, Palm Desert; and Desert Springs JW Marriott Resort & Spa Golf Course, Palm Desert. I like to think that the designers of those courses have, in their own ways, made artistic expressions similar to what you’ll see if you check out the current art exhibit at the Twentynine Palms Visitors Center – they are just using a different medium to create their works. So when you come to visit and look at property in and around these courses, you can see your future home as being surrounded by art that reflects our natural relationship with the most important natural resource: water. Why not start your search today? Download our free golf course resource guide and get a feel for the area, then call or drop us an email so we can answer any questions you might have. What’s in a Rock? A lot of History! Driving through the Coachella Valley and the desert in general—if you’re paying attention and not too distracted by whatever you’re listening to—can be like driving through history. People have been living here for thousands of years and they all have left their distinctive marks on the landscape. To really take a hike back in time, explore the Corn Springs Petroglyph Site sometime when you’re in La Quinta. It’s just a bit further down I-10 and on BLM land. However, here I wanted to open your eyes to an interesting feature you might not give a second look while you’re driving through La Quinta and Indio. It’s called Point Happy Rock. Highway 111 cuts right through it and it’s where the popular Cliffhouse Restaurant is located. A route that really rocks! Today, road engineers tend to plot the course of new highways around rock outcroppings like this. But in the 1930s, when this right of way was originally carved—or blasted—out, the engineers apparently had other priorities. Often when we drive “through”Point Happy Rock, we think about all the people over the years who have traveled this route. When a road funnels through a narrow slit carved through a massive piece of rock, you know that that specific patch of ground will always be a route for commerce. Back in the days of the Dust Bowl, some travelers from the Midwest must have rolled through there. 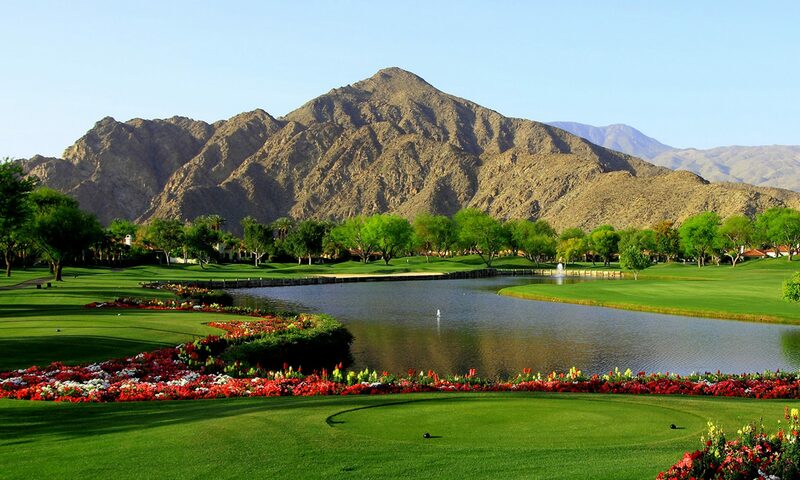 Today, visitors and residents of La Quinta and other communities in the Palm Springs area pass through Point Happy Rock on their way to golf courses such as La Quinta Country Club, Rancho La Quinta, Indian Wells Golf Resort, El Dorado Country Club, The Vintage, The Reserve, and many others. Of course, golfer-homeowners in locations like Rancho La Quinta seldom have to hop in their vehicles and head out onto Highway 111 to pursue their favorite sport. Rancho La Quinta offers 36 holes of golf. Another special treat here is its elevated lots that deliver stunning views of the Santa Rosa Mountains. And if there are non-golfers in your family, the tennis courts, pool and fitness center are great ways to stay fit. I said pool, but I should have said “pools.” However, the main pool at the Racquet Club is the perfect size to put in some laps. When you drop in to get more details on some of these properties and the various golf options you have, be sure you have our free golf resource guide with you. It gives a great “birds-eye view” of the area. Combine that with one of the local books that talk about desert history, and you’ll really be able to maximize your understanding of this special area. La Quinta Is Ready For The Season! This is one of my favorite times of year in The Desert. All the grasses have been changed from the summer seeding to the winter and they are now coming up green and beautiful. The winter flowers are being planted, everything is looking spectacular, and the weather is perfect. Here in La Quinta, the inventory for homes for sale is still very low. The prices have started to rise, but there are still great values compared to anywhere else this beautiful! What a great time to check it out before everyone else arrives! While using the map to search for properties, it is hard to know which side of a street the house is on because the icon may appear to be in the middle of the street. The house number will tell you the homes orientation. Odd house numbers are on either the west or south side while even numbers are on the north or east side. On north-south streets, the first 2 digits are from the “Avenue” to the north. So if you were driving south on Jefferson, as you pass Avenue 48, the addresses would be 48-001 to 48-999 and then you would be at Avenue 49. So, if you saw an address of 50-123 you would know it was just south of Avenue 50 on the west side of the street. East-west running streets are a little different in that ‘anchor’ streets have names. 78000 numbered homes start on the east side of Washington St. north of Fred Waring (Ave 44). Between Fred Waring and Hwy 111, Washington Street moves to the east so it can continue south next to the Santa Rosa Mountains so 78001 is a little west of Washington Street south of Fred Waring. 80000 is at Jefferson, 81000 is at Madison, 82000 is Monroe, Jackson is 83000 and Van Buren is 84000 etc. One exception to this rule is when a street curves – an east/west street may continue it’s numbering system as it bends into a north/south street or vice versa. Just south of the city’s “Old Town” section, is a community known as the “La Quinta Cove”. It is a non gated community of about 5,000 homes that was developed in the late 70’s but it’s roots go back to the 1920’s or earlier when the area was known as Marshalls Cove and was used for farming. The majority of these homes are 2 – 3 bedrooms and about 1,400 – 1,800 sq ft but there are several larger homes mixed in also. Click here to locate the Cove on our search map. Where are we really? or where we really are! The bad news is that none of the mountains you see surrounding us are the Chocolate Mountains. The good news is that there really is a range called the Chocolate Mountains but they are mostly in Imperial County and aren’t really visible from north of the Salton Sea. The Chocolate Mountains are actually used by the Navy and Marines as an aerial and gunnery practice range and definitely off limits to people. They are east of the southern end of the Salton Sea. The mountains most commonly referred to as the “chocolate mountains” are the mountains to our north. The same mountains that the afternoon sun paints so beautifully, are actually the “Little San Bernardino Mountains” that run east along the north side of I-10. The Mountains that you see to our east and south of I-10 at called the Chuckwalla Mountains and they run south to the north end of the Chocolate Mountains. There aren’t any noteworthy ranges to the south of the Chocolates. The western side of our valley is bordered by the San Jacinto mountain range. The most prominent mountain is named Mount San Jacinto and is 10,834 feet tall. It is on the south side of the San Gorgonio pass (I-10) and is snow covered most of the winter. The Palm Springs Aerial Tramway runs up the side of Mount San Jacinto to the 8,500-foot level. The San Jacinto Mountains are a relatively compact but tall range. On the north side of I-10 / San Gorgonio Pass is the tallest peak in southern California (7th tallest in the lower 48). Mount San Gorgonio (snow covered longer than Mt San Jacinto) makes up the eastern end of the San Bernardino Mountains and rises 11,499 feet above sea level. The smaller Santa Rosa Mountains run from just south east of Mount San Jacinto (near Rancho Mirage – Palm Desert area) in a southeasterly direction to roughly the north end of the Salton Sea (just south of La Quinta). These are the mountains you see looking south beyond PGA WEST. © 2018 Gallaudet Properties. All Rights Reserved.